A dozen burglaries at small, locally owned businesses ringing Nicolet Park are drawing increased law enforcement into Lexington Park, MD. St. Mary’s County Sheriff Tim Cameron spoke last week with a few dozen residents and business owners in the area and said that additional personnel, both plain-clothed and uniform officers, are working in the area to catch what is believed to be up to six perpetrators. “We are aware that crime reduces commerce,” he said to the business owners, some of whom have taken on crime-prevention tactics themselves. For example, the sheriff said, Jerry’s & Son Carry-Out has been broken into multiple times and has installed new security measures on the building. The owner of the Lexington Park Dairy Queen on Great Mills Road, has not been hit in the recent spate of burglaries, but said he keeps the store’s exterior lights on all night, saying the extra $40 a month in electricity is worth it. The eight officers at the briefing encouraged lighting as a strong criminal deterrent. Also hit in the area, although not all the break-ins resulted in loss, have been Subway, Popeye’s, Ledos, Cap’n Pat’s, Wendy’s, Vape Jungle, Showtime Deli, and The Tackle Box. 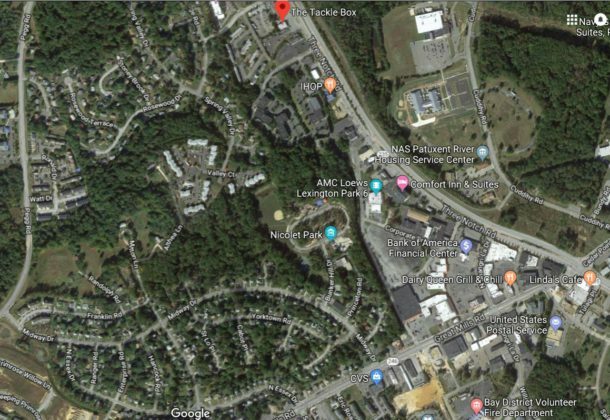 The Tackle Box, outside the Great Mills Road corridor that contains the other victims, had handguns stolen and not for the first time, said participants and law officials at the meeting. The recent theft drew the Alcohol Tobacco and Firearms into the investigation and there is a $10,000 reward for information offered. To contact the ATF anonymously, call 844-AFT-TIPS (888-283-8477) or e-mail ATFTips@atf.gov. St. Mary’s County is offering up to $1,000 for tips and you can call the Crime Solvers line anonymously at 301-475-3333 or text TIP239 and message to CRIMES. Also out of the burglary pattern are two armed robberies. On July 22, two people were robbed by two black men, one carrying a handgun, at PNC Bank on Great Mills Road. A second robbery the next night with the same description of perpetrators with one carrying a handgun was reported at the Wawa on Route 235 at Rue Purchase Road. Specifically in regard to the burglaries, detectives believe there are multiple perpetrators and that there will be members of the community who know them. “I know people know who these people are,” said Detective Sgt. Thomas Hedderich. Any time you have a pattern crime, said the deputies at the neighborhood meeting, think up to a half dozen people can be involved. That many people, they said, someone is bound to let something slip. The sheriff also addressed concerns about rumors of suspicious circumstances surrounding a man found in Nicolet Park last week. Willie Miller, of no fixed address, was known to law enforcement personnel, one of whom found him dead on a park bench. Public Information Officer Cpl. Julie Yingling said following the Sheriff’s Blog accessible via FirstSheriff.com webpage would keep the community up to date on facts versus rumors. She encouraged residents and business owners to visit the pages for updates on arrests and actions of the department.